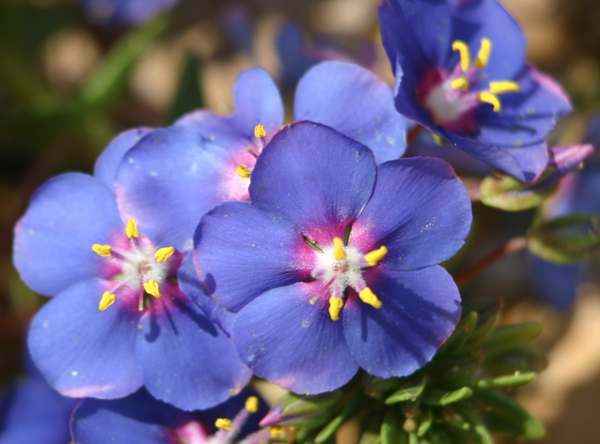 This lovely deep blue-to-purple flower is related to the Scarlet Pimpernel, Anagallis arvensis, with which we are so familiar in Britain and Ireland and which can also, confusingly, occur in a blue-flowered form. This low-growing shrubby branching perennial has opposite or whorled oval or lanceolate leaves on round-sectioned stems. As well as the common blue form shown here, red, pink and white colour variants of this species also occur. The flowers, which have five unlobed petals, can form mats so dense that te leaves are all but obscured. Shrubby Pimpernel is a native of the Iberian Peninsula, Sardinia, Sicily and North Africa and appears in rather dry habitats such as stable sand dunes and banks but can sometimes be found in open woodland too. Ribbons and large patches of Shrubby Pimpernel are wonderful sights on dry roadside verges and the banks of steep-sided cuttings. This wildflower also grows in colourful clumps in coastal garrigue habitats such as the wonderfully diverse pin-cushion floral landscape along the cliff tops at Cape St Vincent, in the southwest corner of Portugal. A member of the Primrose family (Primulaceae), the flowers can sometimes be red or pink, and Shrubby Pimpernel is frequently encouraged as a garden plant. 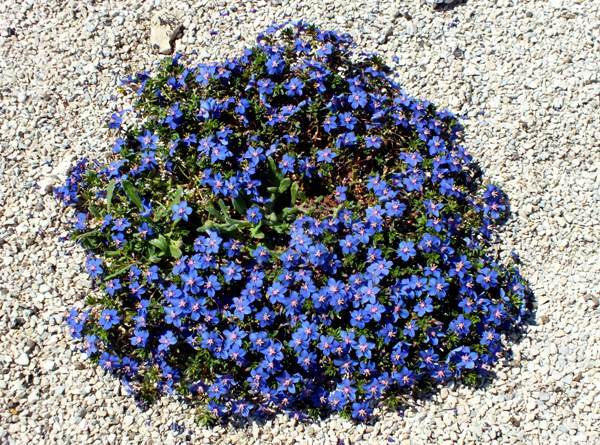 In the wild Shrubby Pimpernel forms dense mats of glorious blue flowers from March to June. The genus name Anagallis comes from Greek and means 'to delight again' - a reference to the daily reopening of the flowers whenever the sun shines. Carl Linnaeus, who described this pant scientifically, gave it the specific epithet monellii to honour French horticuturalist Jean Monelle, who had introduced this plant to Linnaeus's native Sweden. 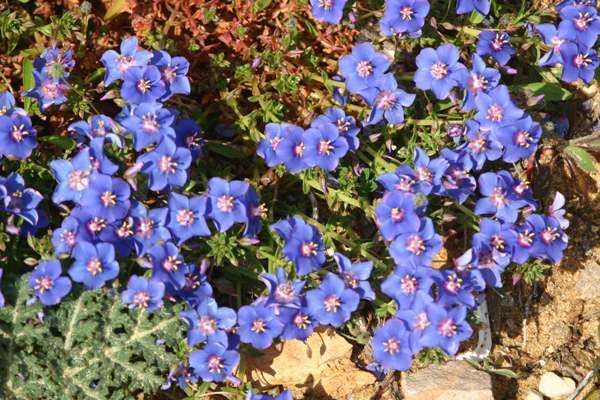 In its less common blue form, Scarlet Pimpernel Anagallis arvensis is similar to Shrubby Pimpernel, but the flowers are smaller and its annual plants not shrubby. The specimens shown on this page were photographed in the Algarve region of southern Portugal during April and May.